This spacious and sophisticated lakefront home has recently been improved with a major remodel that spared no expense. Ideal for entertaining after a great day on the Lake, the upper floor boasts a spacious great room that opens up to a large deck with a gas grill overlooking the cove and Lake. Vaulted ceilings with new LED lighting set on dimmers with new wood flooring, gives this lakefront home a modern sophisticated feel. There are 5 bedrooms and 4 1/2 bathrooms, a kitchen with stainless steel appliances, a downstairs den, and even an extra game room with a pool table! The Master suite with all new alder cabinetry with “honed” black absolute granite countertops and a limestone shower with porcelain flooring. The second master suite also consists of alder cabinetry, stone counters and heleila limestone shower with porcelain flooring. The hallway bath also has been completely remodeled with alder cabinetry, stone counters and heleila limestone shower with porcelain flooring. The top floor’s spacious bedroom has its own new half-bath with a suspended vanity with stone countertop and porcelain flooring. The home also provides a new energy-efficient dual-zone HVAC system. The property has its own private dock and spacious yard, and also comes with the benefits of the Lake Shore Beach Club common area. 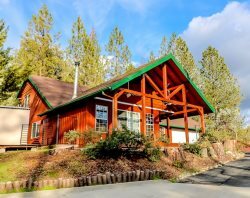 The home is near the Pines Village area at Bass Lake, which provides restaurants, a general market, bars, shops, and a full-service marina with rentals for boats, jet skis, and other watercraft. Bass Lake offers boating, hiking, fishing, and bicycling. The town of Oakhurst is about 7 miles away, with shopping, restaurants, wine bars, a brew pub, a movie theater, and a live stage theater. The Chukchansi Casino in Coarsegold is 18 miles away. Bass Lake is less than 15 miles from the southern entrance of Yosemite National Park.